Election Exit Poll Live: The Assembly elections in five states – Madhya Pradesh, Rajasthan, Chhattisgarh, Telangana and Mizoram – concluded on Friday evening. The Assembly elections in five states – Madhya Pradesh, Rajasthan, Chhattisgarh, Telangana and Mizoram – concluded on Friday evening. The contest has been fought fiercely by all leading political parties. In Madhya Pradesh, Rajasthan and Chhattisgarh, there was a direct contest between the Bharatiya Janata Party (BJP) and the Congress party. Telangana witnessed a multi-corner contest with parties like Telangana Rashtra Samithi (TRS), Telugu Desam Party (TDP), BJP and Congress in the fray. 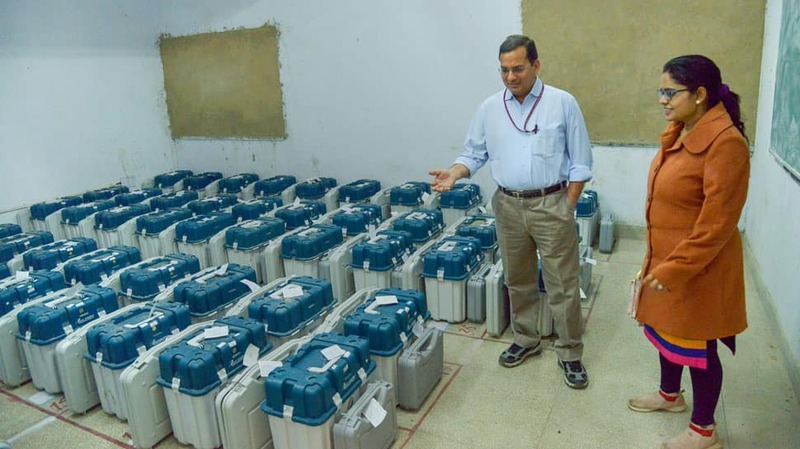 Polling in Chhattisgarh was conducted in two phases – November 12 and November 20, in Madhya Pradesh and Mizoram on November 28, and in Rajasthan and Telangana on December 7. While the results are set to be declared on December 11, Zee News brings a ‘Maha Exit Poll’, which would indicate which way the political balance would swing on the counting day. Jan Ki Baat Exit Poll for Telangana says TRS will retain power, winning 58 seats, the Congress+TDP alliance will bag 45 seats and the BJP will win six seats. Pace Media Exit Poll - The Congress will win 115 seats in Madhya Pradesh while the BJP will bag 103. Others likely to win 12 seats. CSDS Exit Poll - The BJP will emerge as the single largest party in Chhattisgarh, bagging 44 seats. The Congress will win 40 seats while others will get 6 seats. According to Axis Exit Poll for Rajasthan, Congress will secure majority with victory on 130 seats while the BJP will win 63 seats. The BSP is unlikely to bag a single seat while others will win 7 seats. CSDS Exit Poll for Madhya Pradesh says the Congress will gain majority in the state, winning 126 seats. The BJP will win 94 seats while others will get 10 seats. Accordint to Jan Ki Baat Exit Poll for Rajasthan, the BJP will win 93 seats while the Congress will win 91. Others likely to play a major role with victory on 16 seats. According to Jan Ki Baat, the BJP will retain power in Madhya Pradesh with victory on 118 seats while the Congress will bag 105 seats. Others likely to win seven seats. According to CNX Exit Poll, the TRS will win Telangana with 66 seats while the Congress+alliance will get 37 seats. The BJP will bag seven seats while others will get 9. As per CNX Exit Poll for Chhattisgarh, the BJP will retain power in the state with 46 seats while the Congress will get 35 seats. The JCC+ will get 7 seats and others two. As per Axis exit poll for Madhya Pradesh, the Congress will get 41% of the votes while the BJP will get 40%. No party will secure majority in Madhya Pradesh while the Congress will emerge as the single largest party, says Axis. According to CNX, the Congress will regain Rajasthan with victory on 105 seats. The BJP is expected to get 85 seats while the BSP will win two seats and others will bag 7 seats. According to C-Voter, the Congress will emerge as the single largest party in Madhya Pradesh with victory on 110-126 seats while the BJP is likely to bag 90-106 seats. According to Pace Media, the Congress will get 45-51 seats in Chhattisgarh. The BJP is likely to win 36-42 seats while others may win 4-8 seats. According to Axis Poll, Congress is likely to get 113 seats in Madhya Pradesh while the BJP will get 111 seats. The BSP is not expected to get any seat and others will win seven seats. CNX Exit poll - BJP set to retain Madhya Pradesh, likely to get 126 seats. Ahead of the exit polls, Bharatiya Janata Party (BJP) spokesperson Sambit Patra says that the party is confident of victory in Rajasthan, Madhya Pradesh and Chhattisgarh. Patra recalled that Prime Minister Narendra Modi had said that the results in Rajasthan this time will change the usual tradition of any party not retaining the state in any Assembly elections.